For each major Magic release, I work with our creative folks to put together two marketing kits for retailers. One comes in the mail. The other is digital—dozens of downloadable materials, produced by Wizards' designers with WPN members and only WPN members in mind. If you're only using the first one, you're missing out on half your kit. 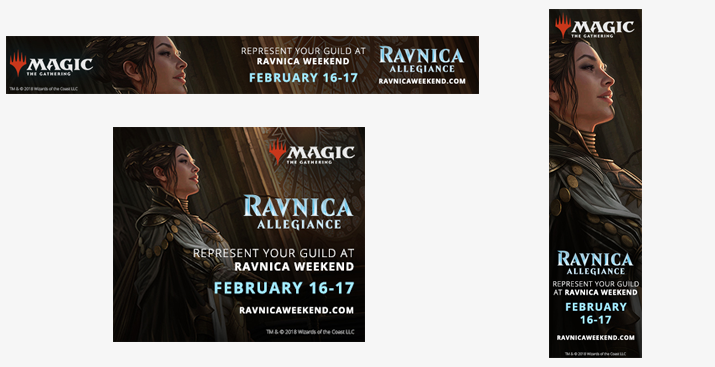 For Ravnica Weekend, coming up on February 16, we've got a full suite of free, downloadable materials you can use to get the word out about your events. The first round of Guild Kits was stuffed with well-received reprints, plus a nod to the Commander crowd: a handful legendary creatures in the legendary frame for the first time. A lot of stores sold out instantly, and we're hoping for similar success with Ravnica Allegiance. 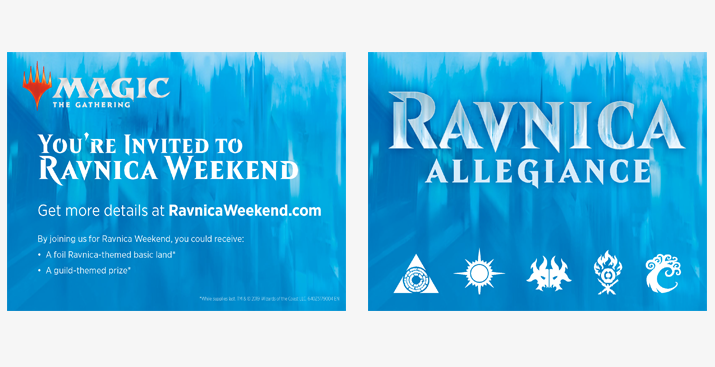 Use these table talkers to get the word out: Ravnica Allegiance Guild Kits complete the series with the five remaining guilds: Azorius (white/blue); Orzhov (white/black); Rakdos (black/red); Gruul (red/green); and Simic (green/blue). Just print, cut, fold, and set them out during your event. A big part of my job is staying up on best practices for ad sizes and working to create versatile assets—marketing materials that can meet a lot of different needs without sacrificing efficacy. Web banners, for example. These can be used in many ways on your website as well as to get a bigger reach by using an advertising platform like Google. However you use them, the common wisdom holds that ads are more effective when they are “above the fold” on a web page—when a user doesn't have to scroll to see them. For that reason, we do our best to find sizes that will fit a standard page in most cases and cover the areas above the fold to help you get the most traffic. We also offer them in a few different file types, to meet your needs in different use cases. For print materials, go for the TIFF and PDF files—they're really high resolution. PNG files and JPG files are better for web use. They're smaller, so they don't take long to load. These are replicas of the Invitations you found in your Prerelease kit. 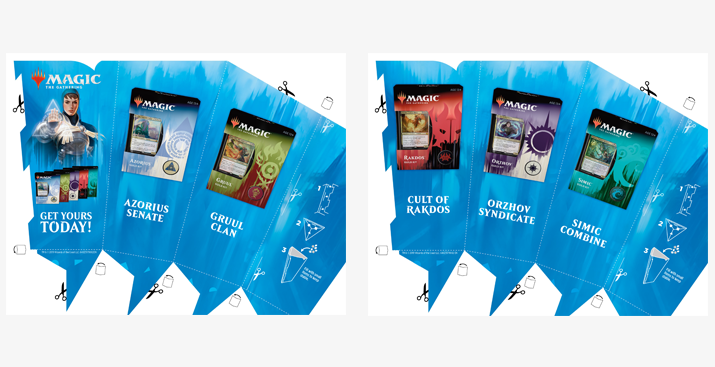 When we did them for the previous Magic set, we found that a lot of stores ran through them quickly, so we put together digital versions to hand out as liberally as you choose—in your event space, at your point of sale, or anywhere else. Something missing? Let me know. I diligently monitor our analytics to get a handle on what's working for you and what isn't. So, if you downloaded any of the above, thanks for the feedback! But I also love to get detailed suggestions. If you'd like to make any, reach out. You can talk to Retail Support team, email me, or leave some feedback with Nelson on the WPN Facebook group. It's common that I get a suggestion and act on it. Happens all the time. A lot of the materials we offer were created as a direct result of suggestions from retailers. I can't always act on feedback immediately, but I always consider it for future materials. In the meantime, use the links above to get all the materials you need for Ravnica Wakened. And don't forget to let me know what you think! The Best-Attended Season In Magic History Was. . .